Wondering how to create a keylogger or how to make a keylogger in notepad? Well if the answer is yes then we are here to help you out. As you read further in this article we will be sharing some of the simple steps to create a notepad keylogger and explain some of the top factors that you will need to keep in mind while making a keylogger. As you read further in this article you will get to know about three methods to create a keylogger. The first one is the notepad keylogger and the second is the python keylogger. However, before we head into the topic let’s have a quick look at what a keylogger actually is. In simple words, a keylogger is an application that tracks your keyboard strokes and stores the data in a log file. A keylogger can be used for surveillance as well as hacking purpose. Most of the hackers use a keylogger to get access to social media accounts password and bank login details. Keyloggers can save your social media account password. It can track the websites that you visit by typing the URL. It can also capture the emails that you sent to others. It can record all the software that you run on your computer. 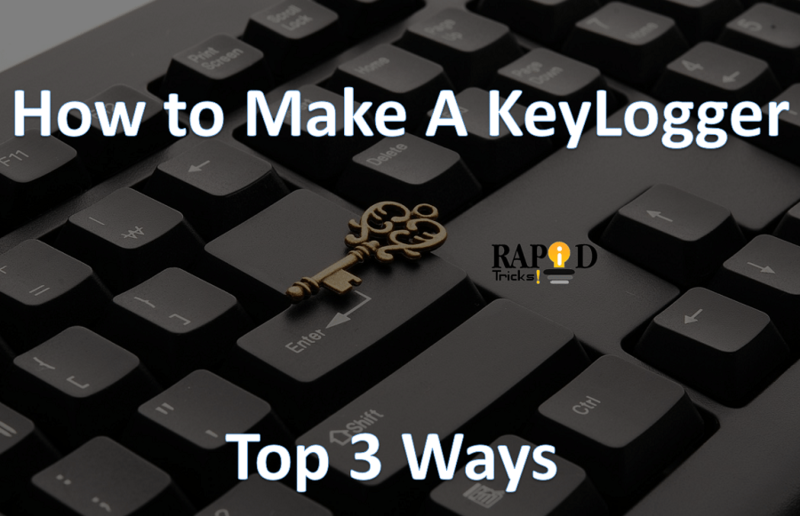 Here I am going to explain three working methods to create keylogger on PC, one of the methods is “How to make a keylogger in notepad” and another one is “How to make a keylogger in python”. So first let’s have a look at the method to make a keylogger using notepad. Step 1: First of all open Notepad on your Windows computer. Or you can use other text editing applications as well. Some of the popular Text editor applications are Notepad++, Sublime Text, Atom and so on. So you can download any of the text editors or you can use Notepad application from your computer. Step 3: Once you are done entering the code. You have to save the file as “Logs.bat”. Make sure you are not changing the code, as the code will only work if the filename is Logs.bat. So make sure you are keeping an eye on that. Step 4: After saving the file, close the Notepad application as you will not need it anymore. So after saving the file, you have to create a folder on the Local Disk (C). So go ahead and make a folder on the Local Disk (C) with the name of “Logs”. Make sure the folder name is Logs as it will only work if the folder name is Logs so you have to keep an eye on this as well. Now you have to copy the Logs.bat file and paste it into the “Logs” folder. Once you are done pasting you are good to go. In order to make a USB keylogger. Here are all the steps that you have to follow. Step 1: Get a flash drive or pen drive or you can use a portable hard disk drive. Step 2: Now you have to download the Shadow Keylogger application. The application is completely free and you can download it via this link. Also, make sure that you are installing the Shadow Keylogger on the flash drive and not on your computer. Step 3: After downloading the application you have to install it. So double click on the downloaded file and follow the screen instructions in order to install the application. Step 4: Now make sure you have .NET Framework 2.0 or later Net framework version installed on your computer. If you dont have Net Framework then you can download the Net framework from this download link. Step 5: Once you are done installing both of the application. It’s time to activate the keylogger so in order to activate the keylogger open the Notepad application from your computer. Step 7: Now save the file as config.xml. Also, make sure you are saving the file in the flash drive along with the Shadow Keylogger application. Step 8: Now in order to make the keylogger work just double click on the Shadow Keylogger application and it will start recording the keystrokes. Step 1: So first of all download and install the Python if you have not yet. In order to download python, you have to visit this webpage and download the Python 3.6.3 MSI file. Step 2: Once downloaded, double-click on it and click on run. After clicking on RUN the installation process will begin. Step 5: Once you are on the IDLE click on the File then click on the New file from the top navigation menu bar. Step 8: Once saved double click on the file and you are good to go. So that was all for the how to make a keylog. Just in case if you have any questions then you can comment below. Also if you are trying out the python keylogger then it is advisable to have the basic knowledge of python programming else it will be hard for you to understand things. Because Python is really an advanced language for a newbie to understand it completely. I hope this article on How to create a keylogger helps you to in creating a keylogger in the best working method for you. If you still have a question or doubt on How to create a keylogger then you can tell me in the comment box. If you liked the article then do share it with other programmers and help them solve the problem.